On a December day in 2010, my 24-year-old son, Kelly, was one of them. 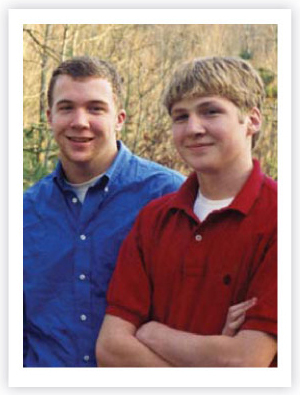 Five years earlier, I lost my 21-year-old son, Christopher, in the same way. My two boys: gone. Addiction won, despite the persistent efforts of those of us who loved them, even despite their own desire to escape the disease’s brutal hold. But addiction doesn’t always have to win. I am proud to announce that with the blessing and support of my sons’ family, I have established the Chris and Kelly’s HOPE Foundation to fight this insidious disease. The Foundation’s mission is to provide financial support to programs that treat teens and young adults who struggle with substance abuse and addiction. The Chris and Kelly’s HOPE Foundation operates under the auspices of the Community Foundation of Greenville, but is committed to assisting worthwhile organizations nationwide. Please consider making a donation to the Foundation. By supporting quality treatment programs, your contribution will not only help save lives, but heal whole families and communities. Every teen or young adult who finds recovery is someone’s sister or brother, someone’s niece or nephew, someone’s neighbor or cousin or teammate or friend. You can send your donations to the Chris and Kelly’s HOPE Foundation c/o The Community Foundation of Greenville, 630 E. Washington Street, Suite A, Greenville, SC 29601. Please make checks payable to Chris and Kelly’s HOPE Foundation. You can also donate online at https://www.cfgreenville.org/donate/. Please designate the Chris and Kelly’s HOPE Foundation Fund. Don’t hesitate to contact Bob Morris, President of the Community Foundation, at 864-233-5925 if you have any questions or concerns. Thank you for considering a donation to this very worthy endeavor. © 2012-2019 Chris and Kelly's Hope Foundation. All rights reserved.